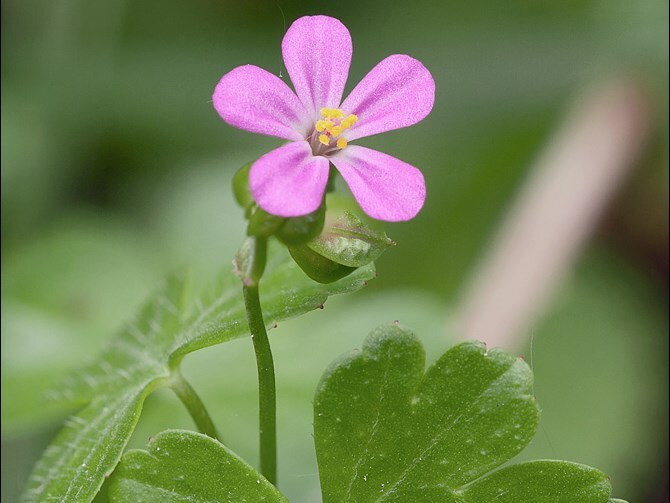 Geranium lucidum (shining geranium) is an annual or biennial herb/ (family Geraniaceae) with pink flowers and wide, shiny, segmented leaves found in the San Francisco Bay area and north coast ranges of California. It is native to Europe, northern Africa and western Asia. It favors grasslands, dunes, and riparian and bottomland habitat. It self-pollinates and reproduces via seed. Seeds are shot from the plant and can travel 20 feet. People disperse seeds accidentally, especially along roadsides.